Even with the advent of gigahertz processors and gigabyte memories, machines still fall flat when they try to translate languages. The latest programs, for example, provide intelligible results—but only in the comfortable range of use for ordinary e-mails and business web pages. Part of the reason is that not only do many words in every language have more than one meaning, phrases can have both literal and idiomatic meanings, making translations by non-native speakers a delicate exercise in avoiding embarrassment and worse—confusion. Add to this the considerable problems presented by individual style and context—not to mention the impressive range of meanings humans can inject into any single word, from love to sarcasm to humor—and you can readily see why even the most advanced machines still struggle to replicate the skill of an experienced human translator. In 1931, the IBM-Filene-Finlay translator was permanently installed at the League of Nations in Geneva. There, some speeches were pre-translated and read simultaneously, while others were presented in the native language first, while interpreters took notes. Then one interpreter would give the speech in his own language, while the others simultaneously recited the speech in their languages. The system was modified during the Nuremberg war crime trials of 1946, for true simultaneous interpretation—speakers had to speak slowly, allowing all of the interpreters to speak along with them. In 1946, IBM began manufacturing the Banks Pocket Braille Writer, a pocket-sized Braille printer; which was donated to veterans and sold to the public at cost. 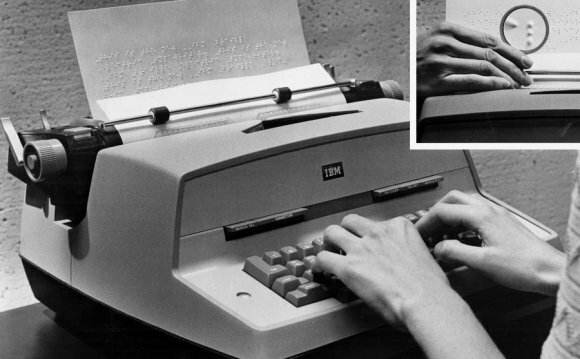 In 1964, the company introduced the first automated Braille translation system at the American Printing House for the Blind (APH), which translated texts into Braille. In 1968, the IBM Braille Model D electric typewriter, which allowed non-Braille writers to create Braille documents, became the first powered Braille writing machine available for individual use. Six different language keyboards were available for use with the typewriter. IBM paired with Georgetown University language scholars in 1952 to develop translation software for use on computers. On January 7, 1954, they demonstrated an experimental software program that enabled the IBM 701 computer to translate from Russian to English. In 1959, the Mark 1 Translating Device, which was developed for the US Air Force, produced its first automated Russian-to-English translation. The Mark 1 was demonstrated for the public at the IBM Pavilion at the New York World’s Fair in 1964. IBM has a rich history of working on machine-aided translation devices dating back to the 1920s, and is currently refining what may be a breakthrough solution for a next-generation translator. IBM founder Thomas Watson Sr. saw the problems of language barriers firsthand in his early work with the International Chamber of Commerce. In 1927, under his direction, the company developed its first translation system based on the Filene-Finlay simultaneous translator. It was essentially an audio setup of headphones and dials that allowed users to listen to professional translators translating speeches in real time. Installed and first used at the League of Nations (a precursor of the United Nations) in 1931, the system allowed listeners to dial in to their native language and hear pre-translated speeches read simultaneously with the proceedings. The IBM ® Filene-Finlay Translator was later modified and used for simultaneous translations at the Nuremberg war crimes trials following World War II, and at the United Nations. Pierre Isabelle is Principal Scientist and Group Leader of the Interactive Language Technologies group at the National Research Council Canada (NRC-CNRC).